Recently 23rd Studios purchase a DJI Spreading wings s1000+ with a Zenmuse Gimbal for our 5d mark 3, we decided to go with the Futaba SG14 remote. Unboxing and getting the Octocopter setup was simple and really didn’t take much time, charging the battery was a boring process and definitely purchase a couple 15000mah batteries or more if you can afford them because this thing eats through them and charging time takes about 4 to 5 hours or more. On our first few flights we didn’t know what to expect and getting this thing off the ground was a challenge mostly because we had never flown anything like this before. 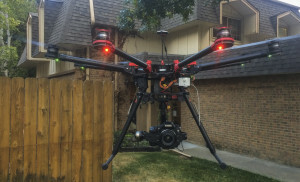 The biggest challenge was working with the balance on take off and sense we did not have the gimbal on the front the drone was back heavy which probably added to why it was taping backwards on take off. After a few backwards tips and a few broken propellers we finally got the hang of it. WOW! Our hearts were jumping out of our shirts to say the least, I even think the thing started to chase me as I wasn’t sure which was to make it go. Ok.. Now we have been flying this thing for a few weeks and have the gimbal attached. Having another 5k attached to this Drone really makes you wonder if and when you crash what will make it through the wreckage. Flying this solo and not having the FPV monitor setup makes the whole process strange since you have no idea what your footage looks like, no telemetry data, nothing. Really use your timer on your controller, it will make you feel a lot better about your experience. I found that flying the Spreading Wings back by us every once in a while was a big plus as it allowed us to check on everything. Now this is not need as the Octocopter has a very bright LED that tells you the status of the Drone and later in the day flying is awesome especially if you have good sight as the LEDs on the bottom of the motors are very bright.